I had read that white warps were not as dramatic as black warps, so I wanted to see for myself. I started with a pre-wound white silk warp from SAORI with 200 ends and 6 meters long. 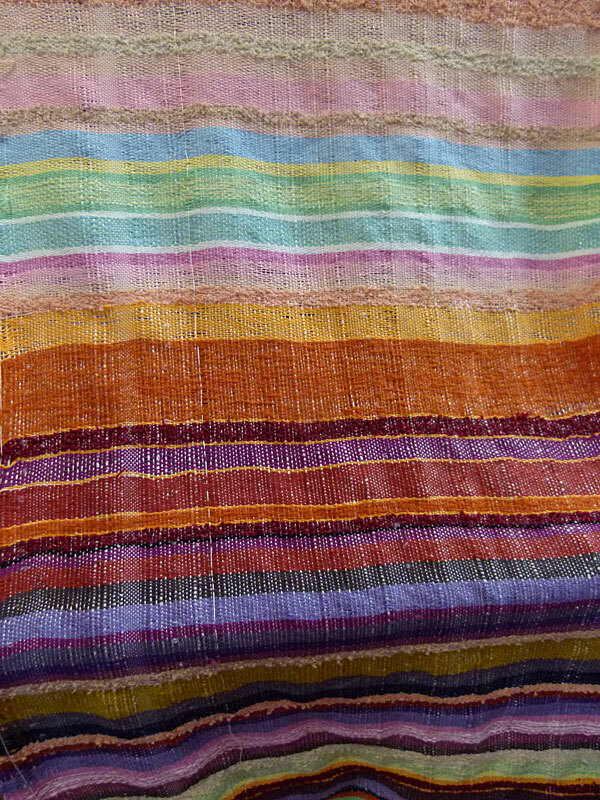 I planned to use all pastel colors in the weft but as I started weaving I noticed that the colors I had chosen lacked contrast. I then rolled some spindles of darker colors and started to like what I was seeing. I realized that the dark colors showed bits of the white warp which made a visual texture while the sections done with pastels did not create that texture. So I decided to just alternate light and dark areas. It was like going exploring to see what each color would look like and how to combine threads for even more color texture. I'm really pleased with the results! I am envisioning a long tunic - maybe even a full dress - for myself.